It's almost 40 years since Intel released its first CPU, the 4004, a ground-breaking processor that crammed all the computing power of ENIAC - the first general purpose computer - into a tiny silicon chip. The CPU world has generated plenty of other amazing statistics over the past few years, but of course this isn't just about the figures: what's more important are the technologies that they've made available. Intelligent cameras with face recognition; spreadsheets with analytical powers that even governments couldn't achieve just a few years ago; cars that are beginning to be able to drive themselves; incredibly cheap and versatile tablets, and smartphones with more power than a 1970's mainframe are all becoming commonplace. That's all great, but it does leave us with a couple of questions. In 1965, Intel co-founder Gordon Moore predicted that the number of transistors on a chip would double, every two years, an observation so accurate and important that it became known as "Moore's Law". And it's this rapidly increasing complexity and power that has driven the amazing gains in CPU performance that we've seen in recent years. ON THE MONEY: In 1965 Gordon Moore predicted exponential growth in CPU power that would lead to "home computers", "automatic controls for automobiles" and "personal, portable communications equipment"
"The trend in CPU performance has been spectacular in all the key parameters: every year more power, more speed, transistors are smaller, energy consumption is down. There are always new challenges to be faced, but I'm sure the trend will continue. We are in good shape to keep evolving the technology for at least a decade, and perhaps much more." It isn't going to be easy, however. Transistor sizes are already tiny, as Gonzalez explains: "Currently we're working to a 32nm process [structures that are 32 billionths of a metre in size], and this will be down to 22nm very soon. That's less than the size of the influenza virus, and 10,000 times smaller than the diameter of the human hair." It's also approaching the size of an atom (around 0.1nm), though, and that's going to present us with a fundamental barrier before too long. And Nandan Nayampally, director of product marketing at ARM, sees another problem. "Starting from around 40nm, the problem isn't really the transistors, it's the wire delay [the time it takes to send signals around the chip]. We are beginning to hit that limit, and it's a major issue for speed." 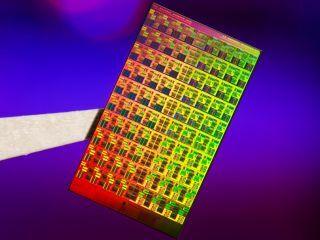 IBM has been researching 3D chip stacking, for instance, which sees CPU cores no longer placed next to each other, but stacked vertically. The cores can be linked by connections covering their entire surface, greatly improving transfer speeds, and they're more easily cooled so heat is less of an issue. And Intel reports that it is investigating "the user of compound semiconductors (rather than silicon)... [which] show promise of greatly improving transistor performance while reducing power" (while many other researchers are looking at possible replacements for silicon). Moore's law will be running into some rather fundamental roadblocks in the 2020s, then, but there are plenty of new technologies on the horizon, and these may enable it to continue for some time yet.